Did you know there are three different ways to edit your white balance in Lightroom? White balance is something that many photographers select with their in-camera settings and its function is to correct too warm or too cool colour casts as a result of the lighting in your scene. For example, fluorescent lighting is very ‘cool’ lighting and your images will take on a cold colour cast if not corrected with a warming colour balance in the camera settings. However, if the images are shot in RAW and the files remain open to total in-computer control, the while balance can be better-altered in computer editing programs. This means you can either alter an incorrect balance or employ changes to achieve a more creative interpretation of your scene (exe: to add a warm, golden hour glow). You can make these changes in a JPG, but the options aren’t as large as those for RAW files. The first way you can change your WB in LR is in the drop-down menu. When you select this drop-down, you are faced with 9 options which are the same settings you will see in your camera. Just click them to experiment and see your image change. If the file is a jpeg, you will see only 2 options: auto and custom. 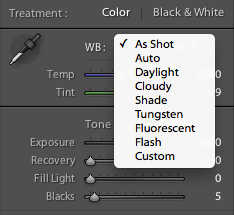 There are two sliders in the white balance section in Lightroom. One for adjusting the temperature and one for the tint. Temperature – the temp slider alters the colour temperature of the photo. Sliding to the left compensates for a too-warm temp by making the image cooler. Sliding to the right does the opposite and warms the photo. Tint – the tint slider compensates for a magenta or green tint. Use the temp slider first and then use the tint slider to neutralise any remaining green or magenta tints left in the image (more prevalent in light sources like fluorescent). My favourite method for changing the white balance of an image in Lightroom is to use the dropper tool. When viewing the image, click the dropper tool in the WB palette and scan your image for something which is neutral grey. If you don’t actually have grey in your image at all, you’re looking for a neutral color. You can identify the color you’re hovering over with the dropper as a neutral when then three R, G & B values are about equal. This is also the best option for altering the WB on a JPEG. Which method is your favourite? I prefer using the dropper method. Thanks for the tip about the dropper tool, I tended to use the slider before. I don't think that method 3 really works that well. Its more like a guessing game, the sliders and your own eye is the best way to do it! The above WB question is more appropriate while shooting on a bright sunny day when your subject is the sun or in the shadow but you still use the FLASH. Which WB will you be choosing? One question regarding the WB. Say, if you set your camera on a WB = Cloudy setting. But you are going to use the flash (external or internal flash) to give the subject proper lighting. Would you be setting your WB = FLASH in that case or leave the WB = CLOUDY? I am assuming you will switch to WB = FLASH. Is my interpretation correct? @ksw: I am not sure that "accurate" is really such, in the sense of replicating the scene my eyes viewed. An example. Let's say that in my living room I have lamps with yellowish shades and bulbs with warm temperature (a very common setting). At night, with that light, my grey card will have a yellow cast, and a white sheet paper will actually be not white to my eyes. However, Using the method 3 I will get my white sheet paper to look pure white. It that acurate? Well, in my view not, because that's not what my eyes saw, and in fact I am removing the warm lighting effect I deliverately put in my living room using those lamps and bulbs instead of fluorescent tubes. Another extreme example: in a pitch black room, I hold a yellow card with natural light. I guess accurate means that the photograph shows the card yellow, ok? But then, in the same room I hold a white card in a completely yellow light (like those used in theaters). What would be an accurate picture in this case? A white card? Maybe what comes out of the camera is not accurate, but neither it is always by using grey cards or the droplet tool. HAha ha ha ha ! DPS is posting stupid articles now ? Method 3 is not a method !!!!! It is a big FAIL ! I have found the auto drop down to be pretty accurate. Thanks for the tips about the neutral gray. Thats awesome. Can I offer option 4? It's kind of taking option 1 a little further. I find it's cumbersome to keep having to select the Drop Down to see a different look. So instead, select each of the settings from the Drop Down and then create a Develop Preset for them. This way when you hover over them in the Presets Menu you will see a preview in the Navigator window. I do the same for the Camera Calibration settings. TFS and inspiring this fantastic conversation. I think one of the great misnomers here is that "accurate" WB is often mistaken as the "best" WB for an image. Sometimes even when I take the time to CUSTOM WB with a Robin Myers card, set it all "correctly," etc. -- I end up not choosing that WB in the end b/c the image calls for something warmer, cooler, or a more "pleasing" WB in the end. The Custom WB helps me get closer to what i think my eyes saw... but it is not always what is most pleasant. To me, sometimes the artistic freedom of ACR, and the many approaches it affords when shooting in RAW is the beauty of this Art. (that said, I am a scientist -- not a photographer -- and I dig the numbers approach). My favorite is to use the dropper and click on something that is supposed to be neutral; then warm/cool with the temp slider. I rarely touch 2nd slider. Thank you thank you for inspiring this conversation, as it helps to hear what others do. nice article on how to adjust your white balance in PP. Now there are a few little things I'd add to this. firstly always strive to get the right white balance in camera when possible, or at least never leave it on AUTO white balance, as this reduces the need to adjust in PP or if there is an adjustment still needed you will be able to batch process the adjustment. secondly you don't always need to use white balance to gain the 'correct' colouration of the image. perhaps you want to give an image a different look, this can often be achieved via white balance, again I tend to do this in camera. For example in the studio I use the preset 'shady' WB to give a model a tan, and use a custom WB to give a 'colder' look. Thanks PMLPhoto. I think I started typing my comment before your comment had been posted. Anyway, thanks for clarifying. The original article definitely implies your should click on a grey section. Very misleading. Hopefully it can be updated. @Gareth - you are right. That is what I was trying to say in a convoluted way one post above yours - click on something that should be a neutral colour (grey, R=G=B). If it is already grey then clicking on it will not change the WB. So for method 3 (dropper) you're saying I should click on an area which is ALREADY grey? I thought you were meant to click on an area which is SUPPOSED to be grey, but isn't because the white balance is wrong. Then Lightroom will adjust the image so the area you clicked becomes grey. WIth method 3, you should not click on something that is grey in the image, rather you should click on something that should be grey but actually does not appear to be grey under the light you have. Imagine an object that is actually grey (grey means R=G=B in this case). If the light illuminating it has a strong red component, then when photographed the grey item will appear with a red cast, and the red channel value will be higher than the green and blue. When you click the eyedropper on the item the software will correct for the colour cast by adjusting the gain of the individual channels to get to a point where R=G=B. The item will now look grey as it should. I prefer the sliders for most of my work. Unless I'm doing, say, an artwork reproduction or very critical commercial assignment (which are few and far between for most photogs), then color is entirely relative. I shoot from the hip and go with what looks good to my eye. Also, if you activate the Eye Dropper tool (W key) then you can use the arrow keys to control the sliders. Up and Down control the Temp; Left and Right control the Tint. Add the Shift key and it will make bigger adjustments, or use the Alt key for small tweaks. 1) What I said earlier is exactely right. If you want the correct white balance then you need a neutral grey. I suggest that you take one photo with a grey card in the picture. 2) I think what you and Matt Klownski are suggesting is that you adjust the white balance to suit your perception of what the picture should look like. 4) For other readers who are not aware of Adobe's Lightroom 3 website go to http://tv.adobe.com/show/learn-lightroom-3 and see more videos. Great post! I have just one minor nitpick: if you have an image which is off in the white balance, the R,G,B readings from the dropper tool will *not* read almost the same on a neutral target; in fact, the difference you'll see there from "sameness" is exactly that is throwing your image off balance. But click that target and LR will do its best to fix it for you. @peter: no, that's not entirely accurate. As you can see here: http://lightroomkillertips.com/2007/white-balance/ Matt Kloskowski didn't have grey in this shot and he explains that it needs to be neutral instead. "If you don’t actually have grey in your image at all, you’re looking for a neutral color"
And what is a neutral colour everybody? That right Grey! You can't use the dropper on white or black, so it has to be grey. If you use it on some thing that is nearly grey, then you are going to get a colour cast. I just want to clarify something and not confuse your readers with some misleading information. When using the eyedropper to set the white balance you should not select a white area such as the teeth. You should be selecting a neutral light grey area. 1) In the Basic panel of the Develop module, click the White Balance Selector tool to select it, or press the W key. 2) Move the White Balance Selector into an area of the photo that should be a neutral light gray. Avoid spectral highlights or areas that are 100% white. 3) Set options in the toolbar as needed. Displays a close-up view and RGB values of the pixel under the White Balance Selector. - The Navigator displays a preview of the color balance as you move the White Balance Selector over different pixels. 4) When you find an appropriate area, click it.